A photo of a sunspot taken in May 2010, with Earth shown to scale. The image has been colorized for aesthetic reasons. This image with 0.1 arcsecond resolution from the Swedish 1-m Solar Telescope represents the limit of what is currently possible in terms of spatial resolution. Scientists have found a way to spot active regions of the sun, below the solar surface, a full day or two before they erupt as sunspots on our nearest star, researchers said. Sunspots, which are temporary dark splotches on the sunwith strong and concentrated magnetic fields, remain largely a mystery, but a team of astronomers has developed a new technique to detect these dynamic regions deep within the sun before they become visible on the surface. This new method, which measures acoustic waves beneath the sun's surface, could help scientists create better and more accurate ways to forecast space weather and potentially dangerous solar storms. Sunspots are patches on the surface of the sun that can be as large as Earth. The origin of these structures is unknown, but they are caused by intense magnetic activity and sometimes erupt into energetic solar storms that blast streams of charged particles into space. Powerful solar storms can occasionally wreak havoc on Earth's magnetic field by knocking out power grids, disrupting satellites, or posing hazards to astronauts in space. Astronomers keep a close eye on sunspots because their number and frequency act as indicators of the sun's activity, which fluctuates on a roughly 11-year cycle. Previously, sunspot regions could only be observed after they appeared on the surface, the researchers said, and little is known about the complex processes in the solar interior that give rise to the dark features. Ilonidis and his colleagues examined sound waves and vibrations generated by the turbulent movement of plasma inside the sun. This technique, called helioseismology, is similar to how scientists study seismic events like earthquakes on Earth. Acoustic travel-time perturbations detected at a depth of about 37,300 miles (60,000 km) on the left, and simultaneous observations of the photospheric intensity (middle) and magnetic field (right). The images of the upper row were taken at about 11:30 p.m. EDT (0330 GMT) on October 26, 2003 and those of the lower row about two days later. The astronomers zeroed in on specific regions of the sun and selected pairs of reference points on the solar surface to measure the time it takes for sound waves to travel between the two locations from a depth of about 37,300 miles (60,000 kilometers). "These waves travel along a path inside the solar interior," said Junwei Zhao, one of the study's co-authors. "Travel times get perturbed if there are magnetic fields located along the wave's travel path." Using this time-distance seismology, the researchers found that when acoustic waves crossed a sunspot, they propagated faster, making the travel times shorter. For a large sunspot, the discrepancy was between 12 to 16 seconds, Ilonidis said. "We made a travel-time map that showed which locations inside the sun had longer and shorter travel times," Ilonidis said. "We identified locations where the travel time was significantly shorter, and from that, we could see that this location is a sunspot region." After the astronomers identified these active areas, large emerging sunspot regions became visible on the solar surface one day later, and smaller sunspot regions appeared two days later. The study's findings are published in the Aug. 19 issue of the journal Science. In the study, Ilonidis and his colleagues successfully detected four sunspot regions. In order to test the significance of their results, the astronomers also analyzed nine regions where they did not find strong acoustic signals, and which later showed no sunspots. The astronomers confirmed their findings using past and recent data from NASA's Solar Dynamics Observatory (SDO) and the Solar and Heliospheric Observatory (SOHO), a joint mission of NASA and the European Space Agency. To build upon their research, and to collect more data, the researchers intend to analyze more active and quiet regions of the sun to hone the accuracy of the time-distance seismology technique. 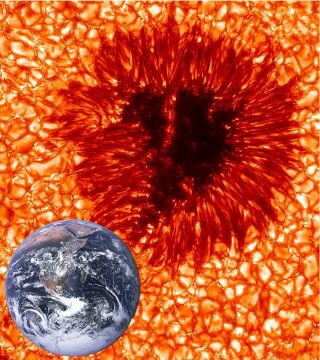 The astronomers are also hoping to probe greater depths of the solar interior, which could also improve the amount of warning time before these active regions erupt. "At 60,000 km, we observe the sunspot regions one to two days later at the surface," Ilonidis said. "If we need predictions of more than two days in advance, we need to go deeper."